Why do some identical twins look so different from each other? Could your eating habits during puberty have an impact on the genetic makeup of your grandkids? These are just two of the startling questions raised by the science of epigenetics, as this "deleted" chapter from David Epstein's book The Sports Gene explains. Top image: A Barn in Överkalix, Sweden, by Adam Lindberg/Flickr. This chapter discusses the nascent field of epigenetics, essentially the study of how our actions and experiences can cause chemical "marks" to attach to genes and turn the activity of the genes up or down. Some of the most provocative work in this field suggests that these epigenetic marks-and not just the genes themselves — may be altered by experiences and passed down to subsequent generations. I decided to cut this chapter from The Sports Gene for two primary reasons: first, the work is so new that I had to caveat the writing rather heavily. Second, as you will see, while epigenetics holds tantalizing possibilities for the study of human health and disease, the minuscule work that has been done on a trait associated with athleticism found —perhaps disappointingly — no impact of the training that one generation did on the fitness of the next. Thus, while I found the reporting for this chapter utterly fascinating, I removed the chapter in an effort to keep the focus on genetic and physiology research that actually has concrete points to make regarding exercise and athleticism. Överkalix is nestled along a fishhook-bend in the KalixRiver, in Norbotten, the northernmost county of Sweden. Not really a city, the remote municipality of Överkalix is actually a collection of tiny villages that weave through evergreen forest. The 3,700 people who live in quaint wooden houses—impeccably painted in pumpkin orange, canary yellow, eggshell, or deep red—are the descendants of rugged, fiercely independent settlers who were already firmly entrenched by the 15th century. The hardy independence of the men and women who settled Överkalix was a necessity, given the fragility of their existence. They kept livestock and fished for salmon, but the quality of their lives hung each year on whether the harvest provided enough barley and rye to get them and their animals through a six-month winter during which the Sun would merely peek above the horizon before retreating into hiding. In years of meager harvest, residents of Överkalix clung to survival by hunting small birds and making bark-bread, so named because it is made from the inner bark of fir trees. 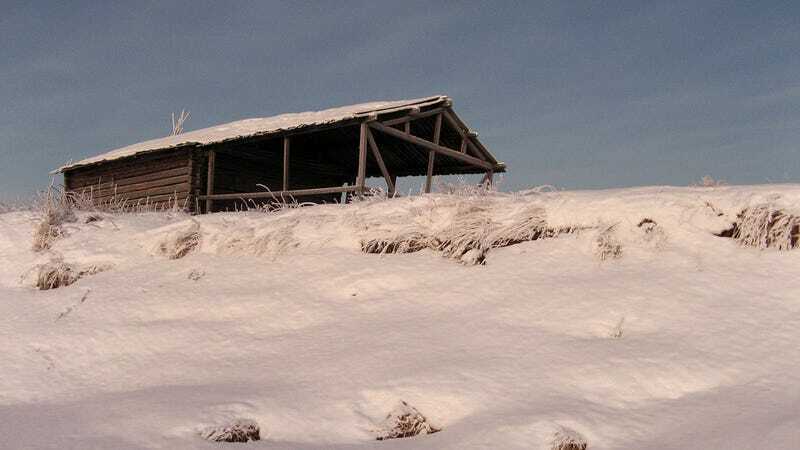 Making do was the theme of life in Överkalix, because every generation faced its own failed harvests, and a failed harvest meant a long winter of hard famine. The first year of the 19th century was a total crop failure. As were 1812, ‘21, ‘29, and the entire period from 1831 to 1836. The years 1851, ’56, ’67, ’77, ’81, ’88, and ’89 weren’t total failures, but pickings were slim. When the earth was bounteous, however, the long growing days of summer in the far north made for a feast. (Even today, residents of Överkalix say the abundance of summer light gives their lingonberries a flavor unique in the world.) In 1799, 1801, 1813-15, ’22, ’25-’26, ’41, ’53, ’79, the Earth spilled forth with a surfeit of food and the people of Överkalix gorged themselves. Most years, though, were average, neither feast nor famine. Civic officials and clergymen meticulously documented births, deaths, and family lineages in Överkalix, as well as details of every harvest. The boom/bust crop cycles were regular enough and so diligently recorded that Bygren and colleagues were able to reconstruct the nutrition available to generations of Överkalix families. Bygren realized that Överkalix, where he was born, would make for a perfect study. Not only were there centuries worth of birth, death, and agricultural records, but the people living in the remote terrain of Överkalix had remained genetically isolated for centuries. Beginning in 1984, Bygren and colleagues assembled the pedigrees of 94 randomly selected people who had been born in Överkalix in 1905. (A total of 199 babies were born in Överkalix that year.) The 20th century saw rapid out migration from Överkalix, so Bygren—who himself moved to Stockholm—had to track the emigrants all over the country. It took four years to gather all the data, but the results were unprecedented. The “early influences” that gave late replies started much earlier than anyone would have imagined. They appeared to start, in fact, with the subjects’ grandparents. Among the 1905 birth cohort, those who were grandsons of Överkalix boys who had experienced a “feast” season when they were just pre-puberty—a time when sperm cells are maturing—died on average six years earlier than the grandsons of Överkalix boys who had been exposed to a famine season during the same pre-puberty window, and often of diabetes. When a statistical model controlled for socioeconomic factors, the difference in lifespan became 32 years, all dependent simply on whether a boy’s grandfather had experienced one single season of starvation or gluttony just before puberty. It appeared that Överkalix grandfathers were somehow passing down brief but important childhood experiences to their grandsons. Bygren knew that such a suggestion would be received by some of his peers as scientific treason. DNA sequences are passed down, experiences, after all, are supposed to die with the individual. Still, the longevity findings in Överkalix were so consistent and pronounced that Bygren and two colleagues began submitting them to scientific journals. But it would be over a decade before the report appeared. “It took many years, and we submitted to many journals,” Bygren says. Scientists who reviewed (and rejected) the paper for publication did not quibble with the statistics. Rather, they said: “it’s impossible,” Bygren recalls. “The results cannot be.” As the rejections piled up from journals, Bygren started scanning scientific literature for anyone who might have similar findings. In 2000, with his work still unpublished, Bygren contacted Marcus Pembrey, a clinical geneticist at the Institute of Child Health in London, and told him about the Överkalix data. Bygren had read Pembrey’s work on children who were missing part of the DNA sequence from chromosome 15. The baffling aspect was not that the DNA deletion caused a disease, but that which disease each child had depended on whether the DNA was missing from the chromosome 15 that came from the father, or the chromosome 15 that came from the mother. If the DNA deletion was inherited from the father, the child had Prader-Willi syndrome, which causes insatiable hunger and leads to extreme obesity. But if the identical DNA sequence deletion was inherited from the mother, it conferred Angelman syndrome, a severe mental impairment that leaves children unable to speak and with herky-jerky movement patterns. Somehow, the DNA deletion on chromosome 15 had a record of whether it came from mother or father. There was no difference in the DNA sequence at all, so something else—some memory of where the chromosome had been—was getting passed down. As with the Överkalix data, it appeared that something other than DNA was actually moving between generations. Bygren and Pembrey decided to collaborate on a two-pronged study to more deeply examine whether life experiences could be transmitted across generations. In one prong, the team used England’s Avon Longitudinal Study of Parents and Children (ALSPAC), which tracked the health and development of thousands of children, starting when they were in their mothers’ bellies. Included in the ALSPAC was data on 5,451 fathers who had been smokers. Of those, 166 had smoked just prior to puberty, when their sperm—the vessels that would transmit their genetic material—were forming. The sons of those men turned out to be fatter, even compared to the sons of men who habitually smoked but didn’t start until after their sperm formation. Again, it seemed that a certain experience—or, in this case, certain toxins—at a certain time could leave some sort of record on genetic material that was passed down. In the second prong, the researchers expanded the Överkalix data to include both men and women from multiple birth years, and what they saw was remarkable. As before, the grandsons of men who had a season of feast just before puberty were at significantly increased risk of earlier death. But they also found that the granddaughters of women who had lived through a famine period when they were in the womb or just born were also at significantly increased risk of early death. In other words, grandfathers who were over-nourished when their sperm were forming put their grandsons at risk of early death, and grandmothers who were undernourished in the womb—when their eggs were forming—put their granddaughters at risk. But how could the non-genetic message be getting passed down? Bygren and Pembrey proposed that epigenetic mechanisms were at work. Epigenetics, which means, literally, “above genes,” describes how genes are turned on and off by certain molecules that attach to them—called epigenetic marks. The marks essentially act like on/off switches for genes. The cells that make up your brain and your muscles all have the same DNA at their center, and yet the reason the cells lead entirely different lives involves how epigenetic marks turn on or off particular genes, giving the cells their own unique identities. That was known well prior to Bygren and Pembrey’s work. The stunning implication of the ALSPAC smoking data and the Överkalix data was that some important epigenetic marks that impact human health might not get wiped clear between generations, but might actually be passed down for multiple generations along with genes. Bygren finally published his initial Överkalix data in 2001, and he and Pembrey published their joint work in 2006, in the European Journal of Human Genetics. Meanwhile, transgenerational epigenetic inheritance was being definitively demonstrated in animals. In one study at Duke, researchers took pregnant agouti mice—they carry the agouti gene, which gives them yellow fur and a propensity for obesity and diabetes—and fed them a diet laden with vitamin B, and thus rich in so-called methyl donors. A methyl molecule (CH3) is a common epigenetic mark, and the diet provided plenty of methyl molecules that could attach to genes and turn them off. In this case, methyl molecules attached to the agouti gene and shut it down. So the obese, yellow mother mice that were fed the vitamin B diets gave birth to healthy, brunette offspring. In another example, fruit flies that were exposed to the antibiotic geldanamycin developed bristly growths on their eyes. And so did many generations of their offspring, even though the offspring were never exposed to geldanamycin themselves. Epigenetic inheritance has been shown to operate in plants as well. Plants in one generation that are engineered to have the same genetics but different epigenetic marks pass down variations in height and flowering time for at least the next eight generations. Needless to say, such multi-generational experiments are understandably difficult to conduct in humans, who have much longer lives than mice, fruit flies, and flowers. With the potential for transgenerational, epigenetic inheritance proven in animals and plants, the natural question became: Can the inheritance of epigenetic marks be proven to occur in people, such that the environments and choices of grandparents are affecting the bodies of grandchildren? A tragic time in history set up the perfect lab. By the last winter of World War II, 1944-45, Allied soldiers had reached the Rhine river, which divides Netherlands into parts north and south. But a loss at the Battle of Arnhem left the northern provinces under Nazi control, and cut off from the southern provinces that provided corn, grain, and fish. Making nutritional matters in the north direr still was the Dutch government’s call for a national railroad strike to impede the transport of German soldiers and supplies. The Germans responded by cutting off all food shipments to Dutch citizens in the northwest section of the Netherlands. The tremendous suffering that ensued in that pocket of the country became known as the Dutch Hunger Winter. Six decades later, an international group of scientists tracked down the children of women who were pregnant during that famine—as well as the children of Dutch women who were in provinces not struck by famine—and looked at a gene known as the insulin-like growth factor 2, or IGF2. The gene plays a key role in body growth and development. The subjects whose mothers were in the early stages of pregnancy during the Dutch Hunger Winter had fewer “turn off” signaling methyl molecules attached to their IGF2 genes compared to their siblings, and to people whose mothers were in the late stages of pregnancy during the famine. So, some six decades after a brief period of intense famine, adults whose mothers were exposed at just the wrong time of pregnancy carried the mark of the Dutch Hunger Winter attached to their DNA. Some of the more mind-boggling results are coming from behavior studies. In 1999, a team of neuroscientists conducted an experiment in rats in which they took the offspring of mothers rats that had been bred to be nervous and not very nurturing—less licking and grooming—and put them with mother mice that had been bred to be calm and nurturing. The adopted rats grew up more calm and adventurous and nurtured their own offspring akin to how their adoptive mother had raised them. The team found that the nurturing in the first few weeks of life permanently turned certain genes up and down in the brain that made the adoptees more resilient to stress. And the mental tranquility was passed down to the adoptees’ offspring as well. In the closest thing to a human equivalent, researchers at the Traumatic Stress Studies Division of the Mount Sinai Medical Centre in New York City tracked women who were pregnant on 9/11 and in the vicinity of the attacks. Some of the women later developed post-traumatic stress disorder, particularly those who had lower levels of the hormone cortisol, which is protective in stressful situations. Specifically, the women who were in the third trimester of pregnancy on 9/11 had babies with low cortisol levels. This area of science needs far more work to provide solid conclusions, but the researchers think that epigenetic marks, set in place by the events of a single day at just the right (or wrong) moment during pregnancy, may be responsible. For sports (or sci-fi) enthusiasts, the tantalizing question is whether a father or mother might pass on not just genes for athletic talent—or lack thereof—but athletic experiences or training habits through the generations. (Imagine the dread of many a former dodgeball target, apt to take such a question too far…). You had the physical gifts to be an athletic star, but not the discipline to wake up early and pick up a barbell instead of a bar of a chocolate. At least your lackadaisical approach doesn’t leave any mark on the genetic gifts you pass to your kid. Or does it? As with any question that you can think of about epigenetics and sports, the answer is unknown. It is known, though, that epigenetic marks seem to have a role in the response to exercise in animals, and in unexpected ways. In a study at the University of Bristol, in England, rats that exercised regularly and rats that did not were thrown into glass beakers of water. Upon splashdown, every rat struggled furiously to swim and scrambled to escape the beaker. The next day, when the rats were put back in the water, the non-exercising rats repeated exactly their fruitless panic strategy of the previous day. They had learned nothing. Meanwhile, the rats with a history of exercise showed superior stress-coping mechanisms. Rather than attempting to fight their way out of the beaker—which was impossible—the exerciser-rats conserved energy by simply floating. The exerciser-rats had learned from the previous day’s trial, and when scientists examined their brains, they saw changes in epigenetic marks in an area of the brain that is involved in creating memories. “Exercise has a very great impact on the brain, and how we deal with stressful events in our lives,” says Johannes Reul, a neuroscientist and one of the researchers. “Exercise does not just act on your muscles and cardiovascular system.” And epigenetics play a role in the response to training in humans as well. A 2012 study by Swedish and Danish researchers showed that when people work out, turn-off signaling methyl molecules are removed—“demethylation”—from certain genes involved in energy metabolism, allowing those genes to switch on. And the extent to which those genes were switched on depended on how hard a person worked out. So training intensity was literally determining how genes were activated. It’s an astonishing finding, given how we normally think of DNA as just a static code. At the same time, it was already well known that something was turning genes up or down during exercise, and to different extents in different people and in response to different training. And the study sheds no light on the quadrillion-dollar question: Can exercise-induced epigenetic patterns be passed down to children or grandchildren, making them better athletes? Already, epigenetics has dragged back from the scientific graveyard certain notions put forward by 19th century French naturalist Jean-Baptiste Lamarck. Lamarck’s theory of evolution proposed that animals adapt quickly to their environment and then pass on those adaptations to their progeny. For example, Lamarck proposed that giraffes inherited long necks from their ancestors who stretched high into the trees to reach leaves. But Lamarckian evolution was eclipsed in 1859 when Darwin published his theory of evolution by natural selection, which says that traits are acquired over many generations as random genetic changes that happen to be beneficial are passed on. Precisely how close to the mark Lamarck was is now re-open for study. Along the twisting DNA ladder, methyl molecules typically attach at a point where a cytosine is next to a guanine along the length of the ladder. (Cytosine (C) and guanine (G), along with adenine (A) and thymine (T) are the four bases that make up your entire genetic code.) In addition to turning genes on and off and up and down, methylation is actually a major source of genetic mutation. Sometimes, when a methyl molecule attaches to cytosine, through a chemical process the cytosine permanently changes into a thymine; a C turns into a T in the genetic code, changing the biological instruction manual. Such mutations actually occur quite often and are incredibly important in evolution. One-quarter of all the mutations that differentiate the human genome from the chimpanzee genome occur at those C-G spots on the DNA ladder. The question, then, is whether environmental influences in one generation might be placing epigenetic marks that are akin to construction signs, marking a spot for a potential permanent change in the DNA sequence that is then passed down. Hard evidence remains beyond the scientific frontier, for now. (Says Bygren: “Pembrey used to say about me and him, we are so old now, we don’t have to worry about the career and can speculate!”) Lamarck was mistaken about effort being the primary driver of evolution. Still, long after his theory was laughed off and supplanted, Bygren and others are wondering — with straight faces — how the life choices of one generation might impact the genes of the next. Amid the endless possible questions about how the choices of your forbears might impact your body today, one safe take-home point is that epigenetics adds yet another level of complexity to biological inheritance. At every turn, genetics has proven to be more complicated than scientists had hoped. Which raises another important question: Given all the complexity, can there possibly be any use at all for genetic testing in sports right now, in the present day? The answer, despite all that complexity: absolutely. © David Epstein, 2013. David Epstein is the author of The Sports Gene: Inside the Science of Extraordinary Athletic Performance (Current, an imprint of Penguin Random House, 2013). Is it really true that homosexuality can be explained by epigenetics?